There are quite a few components within an automotive that produce heat as they function. Protection of various other components from this heat is essential for the safety and longer lifespan of a vehicle. This can be achieved via heat shields specifically made for automobiles, such as exhaust and header wrap, turbo heat shields, and thermal and heat shield sleeving. 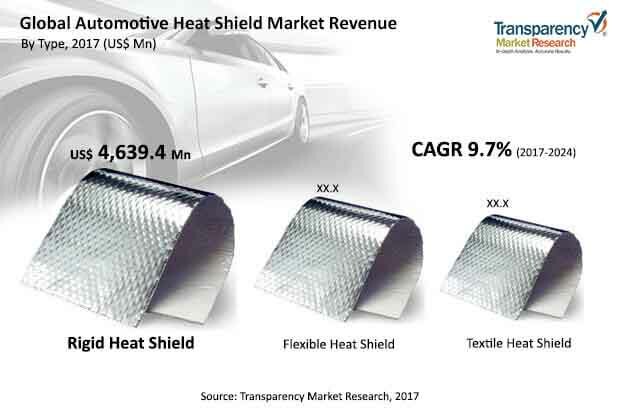 As the automotive industry touches new peaks, especially in emerging economies as a result of increased disposable income of urban populations – the market for automotive heat shield is flourishing. According to the estimations of this business intelligence report, the demand in the global automotive heat shield market will propagate at a highly impressive CAGR of 9.7% during the forecast period of 2017 to 2023. In terms of revenue, the opportunities in the automotive heat shield market, across the world, is estimated to translate into US$25,376.4 million by the end of 2024, swelling up from the market’s evaluated worth of US$13,323.9 million as of 2017. Apart from the growing demand for passenger vehicles, the automotive heat shield market is also feeding off the technological advancements it has made and developed customized and tailor-made products according to diverse requirements. The advent of new segment in the automotive industry including electric and hybrid vehicles is another key opportunity opening up in this market. On the other hand, increasing prices of raw materials, such as aluminum, is obstructing the market from attaining its true potential. Product-wise, the market for automotive heat shield has been segmented into exhaust and header wrap, thermal and heat shield sleeving, heat shield and thermal barriers, spark plug boot heat shields, exhaust heat shield insulation, turbo heat shields, and others. Among these, as of 2017, exhaust heat shield insulation segment had the maximum demand, which reflected a revenue of US$2,965.9 million. Exhaust heat shield insulation increases the exhaust temperature and exhaust flow, which helps build power in vehicles. The main purpose of exhaust heat shield insulation is to reduce under-hood temperatures and maintain hotter exhaust gas inside the exhaust system for more horsepower. It is widely used in catalytic converters, mufflers, headers and for exhaust tubing. Despite holding onto the dominant position, the exhaust heat shield insulation segment is expected to lose a little ground to exhaust and header wrap segment, which is poised to generate a demand worth of US$5,039.8 million by the end of 2024, only about US$400 million behind the lucrativeness of the former leading segment. Exhaust insulation limits the heat generated by the engine and exhaust systems from exhaust tubing and wrapped headers. This results in less flow of heat in the passenger compartment and significantly decreases the heat flow on floorpans and firewall. On the basis of type, the automotive heat shield market has been bifurcated into rigid, flexible, and textile. In 2017, the rigid heat shield segment constituted for more than 34% of the total demand and is primed to maintain its position of moderate dominance throughout the forecast period. Rigid heat shields provide adequate thermal protection as well as act as a shield against stone impingement and track debris. Made from aluminum and solid steel, these heat shields can be easily fitted with rivets and grommets. Moreover, high performance rigid heat shields provided in high-end cars are made of aluminum sheets or other composites of ceramic thermal barrier coating, which ensures better heat insulation. By the end of 2024, the segment is estimated to be worth US$8,622.9 million. This report gauges the potential of demand for automotive heat shield that can be expected out of the regions of Asia Pacific (APAC), North America, Europe, and Rest of the World (RoW). In terms of revenue, Asia Pacific dominated the global automotive heat shield market, followed by North America, Europe, and Rest of the World. By the end of 2024, the APAC automotive heat shield market is estimated to be worth US$8,869.1 million. Economic reforms coupled with growth in the automotive sector are heavily influencing the growth of the global automotive heat shield market. Economic reforms have led to a rise in the disposable income of individuals and growth in automotive sector has driven the production of vehicles. This has indirectly driven the growth of the automotive heat shield market across the globe. Introduction of new segment of vehicles such as hybrid and electric vehicles is also set to motivate the market of automotive heat shields, globally. Increasing private equity investments in the automotive sector and business expansion of automotive heat shield manufacturers into new markets and regions is expected to bolster the growth of global automotive heat shield market during the forecast period from 2017 to 2024. Federal Mogul Corp., Dana Holding Corp., Autoneum Holding AG, and Lydall Inc. have been identified as a companies currently holding prominent positions in the global automotive heat shield market. A vehicles internal combustion engine generates a large amount of heat which can damage the vehicles other components and body work. Moreover heat shields can even increase a vehicles performance by reducing the engine’s temperature. Thus automotive heat shield finds a major application in a vehicle and forms an integral part of a vehicle. In the automotive heat shields, it is essential for all companies to adhere to the safety standards and regulations set up by the governments of their respective countries. Superior quality of products ensures long term business profitability through increased customer satisfaction. Adherence to the quality standards also creates goodwill and a positive brand image of the company. With increasing number of automotive sales across the globe, there is immense scope and opportunities for the automotive heat shield market. There has been significant rise in the sales growth of automotive based in Asia Pacific mainly in India and China. In the coming years, Asia Pacific is expected to dominate the market for automotive heat shields. India, China, and Japan have seen huge industrialization in recent times because of the availability of good natural and human resources. Cheap source of labor, availability of raw materials, good transportation network, and investor-friendly industrial policies are some of the vital factors encouraging global companies to set up industries in these countries of the Asia Pacific region. This in turn is expected to encourage the rise in application of automotive heat shield market in the emerging markets of Asia Pacific. The automotive heat shield market in Rest of the World (RoW) is expected to gain momentum in the next few years. Positive growth in the economies of developing countries coupled with increasing purchasing power of the people are the key factors expected to drive the sales volume of automobiles, thus fueling the growth of automotive heat shields in the emerging markets further. Moreover, a small percentage of hybrid and electric vehicles are already available in the market. The percentage is expected to grow in the coming years because of their eco-friendly use and efficiency. Therefore, with the rise in the number of hybrid and electric vehicles in the automobile market, the application and market for automotive heat shield is set to flourish in the coming years. Electric vehicles can operate efficiently without overheating as compared to hybrid vehicles. However, electric vehicles can run only for a limited distance. Therefore, the penetration of heat shields is much less in electric vehicles than the hybrid ones. This market research study analyzes the global automotive heat shield market and provides estimates in terms of revenue (USD Million) 2017 to 2024. It emphasizes on the drivers and restraints responsible for the growth of the industry and examines their impact during the forecast period from 2016 to 2024. Moreover, it recognizes the important opportunities for the market expansion in the upcoming years. The report offers company market share analysis of key industry participants. Major players have been profiled on the basis of company overview, financial overview, business strategies and key developments. Leading market players profiled in this report are Federal-Mogul Holding Corporation (U.S.), Autoneum Holding AG (Switzerland), Dana Holding Corporation (U.S.), Lydall Inc. (U.S.), UGN Inc (U.S.), Happich GmbH (Germany), Elringklinger AG (Germany) and Progress-WerkOberkirch AG (Germany).